Steve Cohen over on Library Stuff, linked to this great list of unfortunately named athletes. I'm wondering if there is a list of unfortunately named librarians? I do know that my father use to joke about the fact he should have given my brother Paul a different middle name so that his initials would have been PIG, and clearly my parents forgot when then named my youngest sister Helen (middle name Ann.....you figure it out) whose initials changed when she married. My initials are only kind of car tire (MAG), and I can live with that! Here is why I am supporting Camila for ALA President, her most recent post called UPS and ALA. Given that the current President-Elect, Jim Rettig, has expressed similar thoughts about the need to change the profession. Now, this is not to say anything bad about J. Linda Williams (the other candidate) with whom I have worked in ALA. In any case, if you are an ALA member, please vote. I am visiting my family in New England. I arrived last night at my sister's house in Western Massachusetts. 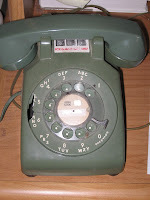 This morning as I am reading email, reading blogs, and chatting with my brother-in-law he mentioned the phone. They have not just one, but two of these phones! I had an uneventful trip from Minneapolis to Bradley, rented a car and got here successfully. Later this week I will be driving my brother-in-law to Maine so that I can visit my sister, and he can visit his parents and sister. We will then go to Northwestern CT for my family's annual get-together. It has been a year (today) since I started work in Wisconsin. It has been an interesting year with challenges related to the fund raising as well as to the "new culture" of the upper Midwest. One year ago today it was snowing in Eau Claire. It is snowing now. We had 6 inches of snow (which ended as sleet/rain) on Saturday night. The public works department has done a great job of clean-up. I'm guessing we are in for a spell of snow. One to three inches are predicted for today, and more on Saturday. One weather forecaster confidently predicted a white Christmas since he does not expect the temperatures to get above freezing this month. I am glad I bought snow shoes, I think I see some adventures on snow in my future!